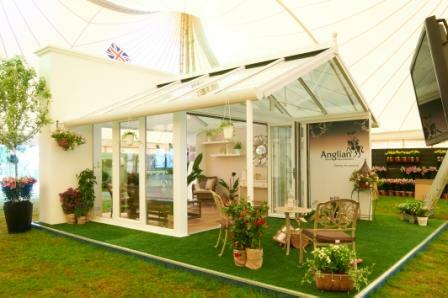 Just as the weather starts to get better after the late spring it is time for the grand ‘Hampton Court Palace Flower Show’ and Anglian Home Improvements are thrilled to announce that they will be at the show again this year. As sponsors of the ‘Hampton Court Celebrity Speakers and Catwalk in Bloom Theatre’, we are pleased that a unique visitor experience will take place in the marquee, with celebrity speakers, special guests and exciting fashion shows throughout the day. A special celebrity guest will be live on stage at 12 noon, 2pm and 4pm each day. The Theatre will also give visitors the chance to see a wonderful selection of Anglian products and a new wooden Orangery that is being displayed for the first time in the country, we hope that it will inspire your home and garden views! David Domoney, TV presenter and garden guru who is currently appearing in the ITV1 hit series ‘Love Your Garden’, will be presenting the event along with the team in the theatre, offering garden tips and advice. Anglian is thrilled to be able to showcase the new wooden Orangery which will allow visitors to walk through the set and experience the products we have on display just as if it were apart of your home. The Hampton Court Flower Show runs from the 9 – 14 July and we look forward to welcoming you onto the stand and helping you choose the right product for your home. We also have some exclusive discount available at the show so stop by and see us! If you have a moment, watch the video below where David Domoney explains about the exciting things that will be happening at the show.